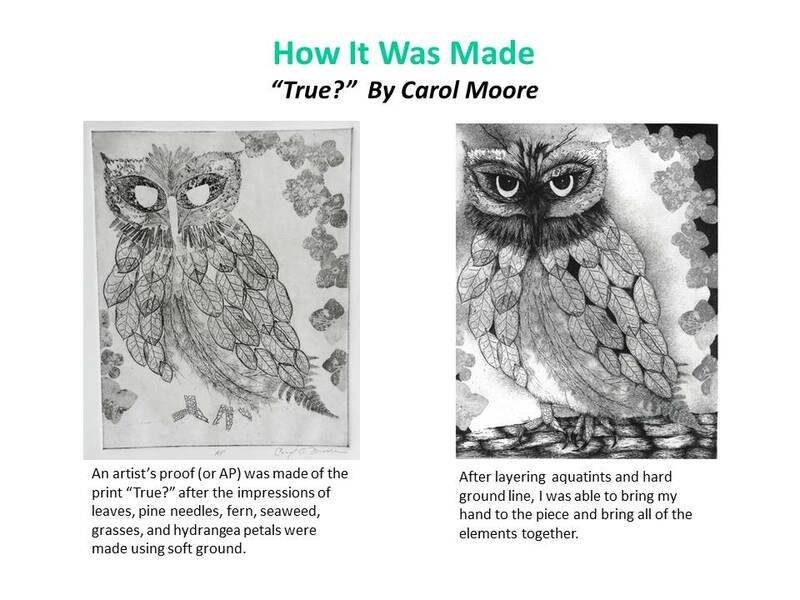 I am often asked what is Intaglio. To simply state the definition does not begin to describe the technical processes that I use when creating my prints. 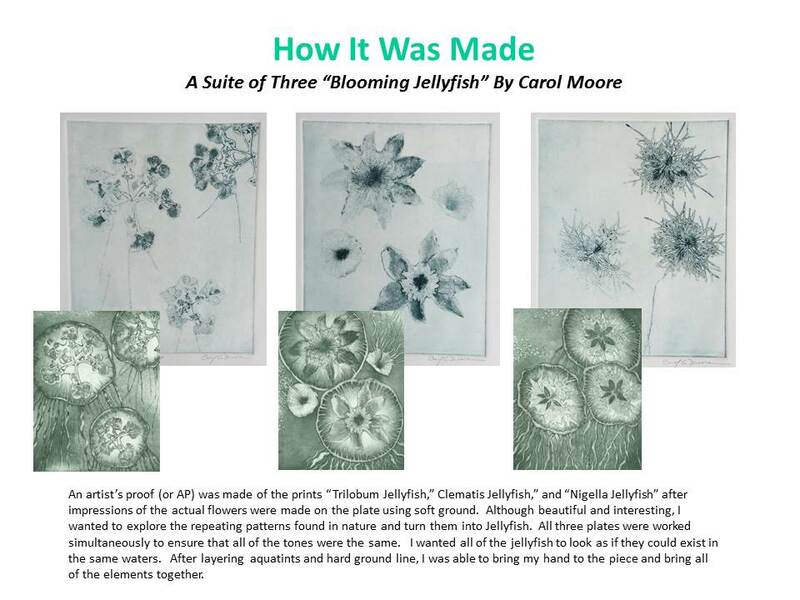 I offer you some brief descriptions of various Intaglio processes and some of the techniques used to enhance them. After drawing through an acid resistant ground (hard ground, soft ground, ball ground, soap ground or resin) that has been applied to a metal plate (copper, zinc, steel, or aluminum) with a sharp tool called a "scribe," the plate is then placed into an acid bath where the exposed areas of the plate are etched. The longer the plate is in the acid, the deeper the etch and the darker the line will appear in the final print. The acid resistant substance that is applied to a metal plate. Many hard grounds are made from asphaltum mixed with beeswax, and resin. The liquid hard ground is applied to the plate and allowed to dry. Afterwards the image can be drawn into the ground leaving the metal exposed where it is then etched in acid. Similar to hard ground, but when it dries it is much softer. Materials of various textures can be laid upon the plate and pushed through a press to leave an impression. The materials are gently removed and the plate is etched in acid. Ball ground comes in the form of a cake that is applied to a hot plate and rolled out with a leather roller. After the ground is cooled, a sheet of paper is laid over the plate and an image is drawn on the paper. Where pressure has been applied, the ground is lifted off the plate onto the back of the paper. The exposed areas on the plate are then etched in acid. 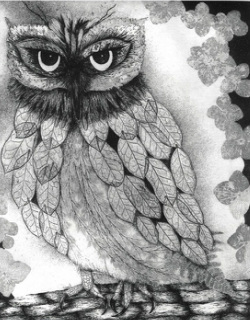 This process allows the artist to draw freely and subtle tones can be achieved. ​range of tones on the plate. A solar plate is a steel plate that has been treated with a UV light sensitive coating. 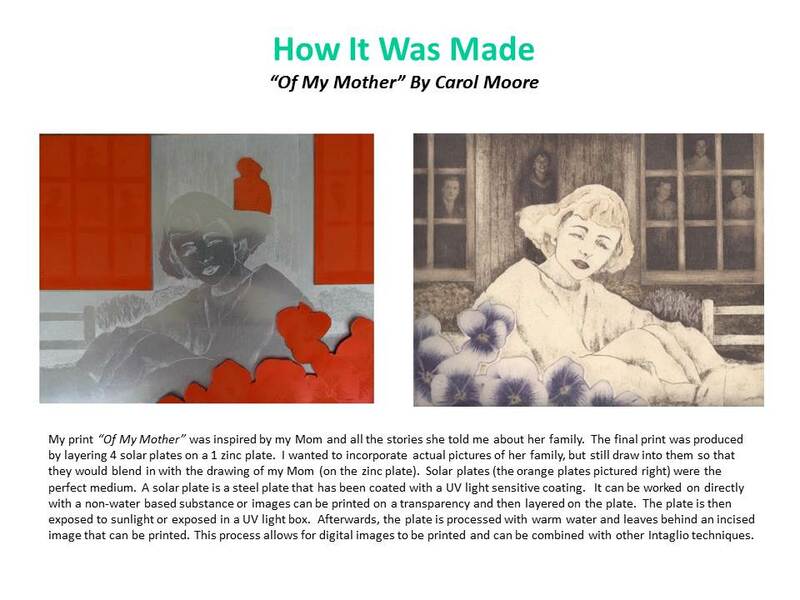 It can be worked on directly with a non-water based substance or images can be printed on a transparency and then layered on the plate. The plate is then exposed to sunlight or exposed in a UV light box. Afterwards, the plate is processed with warm water and leaves behind an incised image that can be printed. 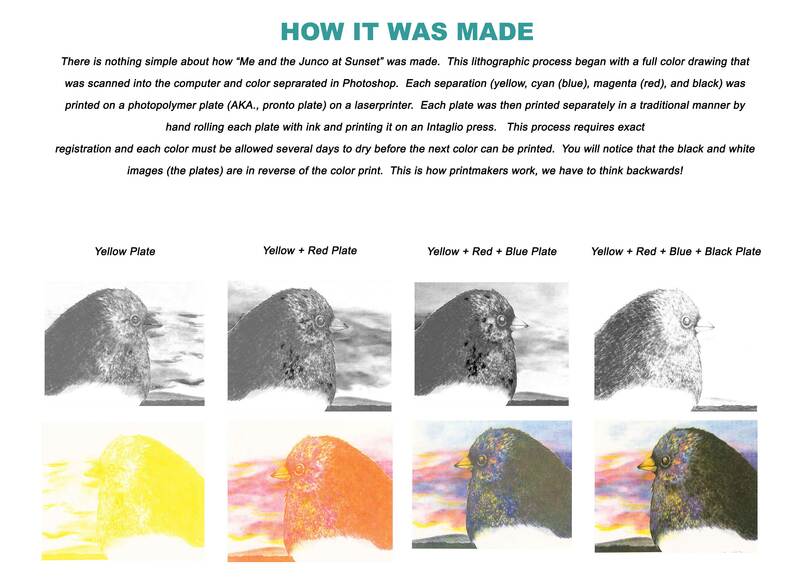 This process allows for digital images to be printed and can be combined with other Intaglio techniques. An engraved image has marks that are cut directly into the plate using a very sharp tool called a graver or burin. This process produces a very clean line. Images are drawn directly on the plate using a sharp scribe or any sharp tool. Unlike marks that are etched or engraved, dry point marks characteristically have a “fuzzier” line due to burrs created when making the mark. A copper plate is rocked with a metal blade that is curved with numerous sharp teeth. The blade produces a burr on the plate that is so dense that when ink is applied, it prints solid black. The image is produced by scraping away the burr from the rocked plate with a sharp metal scraper. A full range of tones can be produced in this very delicate process. A Collagraph is made by producing a plate (metal, cardboard, plastic or any thin hard surface.) made from any materials with an incised surface that are adhered to the plate. Materials such as sand paper , mesh, acrylics, or virtually any surface that will hold ink. Ink is then applied to the collage of materials and is printed with or without a press. A second plate is created by making an offset image of the wet print onto another surface. This allows the Printmaker to add color to a print accurately using multiple plates that go through the press consecutively. Offset plates can be prepared using Intaglio processes or they can be on cardboard that is coated with clear contact paper and inked by hand. Paper that has glue applied to the back which goes through the press with the plate and can be a way to apply color or texture to a print. Applying several colors of ink to the plate by hand with one pass through a press. Color is applied to the print after it is printed. Any material or mark that is added after the image has been printed. The artist draws an image, in reverse, on a fine-grained limestone or an aluminum plate. For a one-color lithograph, this will be the only drawing. Each additional color requires a separate drawing on a different stone or plate. The image is then etched with a mixture of gum arabic and acid. This will make the non-image areas more receptive to water and the greasy areas receptive to ink. The ink is rolled onto the wet stone or plate. ink sticks only to the greasy areas that repel water. Paper is placed on top of the stone and it is rolled through a special lithography press.